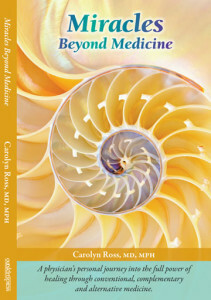 Miracles Beyond Medicine is a book describing Dr. Carolyn Ross’s own personal journey to healing and the miracles she found along the way. As a physician trained at one of the top medical schools in the country, Dr. Ross was surprised to find that she needed more than what she learned in medical school to help her patients. Her determination and commitment to her patients led her to explore many options to treat their medical conditions. In her women’s centers in San Diego, California, she used acupuncture, chiropractic, yoga, nutrition counseling, homeopathy and herbal medicine. It was not until she faced her own personal health crisis that she began to see the full power behind the combined use of conventional, western medicine and complementary and alternative therapies. What began initially as a search for healing for her patients and later for her own mother who was diagnosed with Alzheimer’s, became a search for personal healing. Dr. Ross’s journey led her to interview people she met who had experienced spontaneous healing or miraculous healings from many serious and life threatening illnesses. Dr. Ross was able to identify what she calls the Seven Secrets of Healing – qualities that she found in all of those who experienced self-healing. What she learned transformed her understanding of what it takes to heal and her understanding of her role as a physician. Illness is a call to action. As a physician, it was difficult for me to accept the notion that illness can have a meaning and causes outside of the obvious ones. While cancer is real and bacteria and viruses do cause illness, medical science is beginning to recognize that there are other contributing factors to illness that are not so easy to measure including the mind-body connection. By continuing to grow and change as human beings, we strengthen our bodies, minds and spirits, making them more impermeable to all the causes of illness.